Winter tyres vs 4×4 – HubNut – celebrating the average! 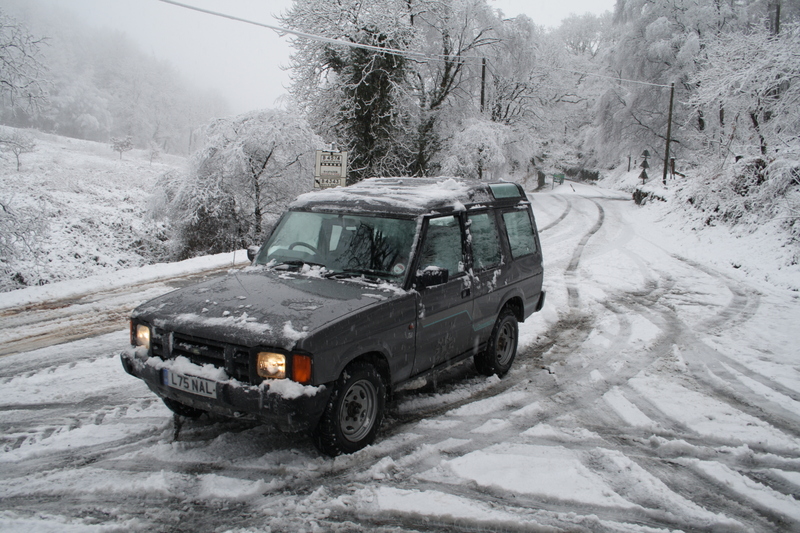 Ok, so this isn’t the most scientific of tests, but an unexpected burst of snowy weather has allowed me to compare my Daihatsu Sirion and its Avon Ice Touring tyres versus my Land Rover Discovery on a set of Avon Ranger All-Terrain tyres. It has been a very interesting day. First of all, I’d like to point out that the biggest factor in surviving tricky conditions on the road is the driver. Owning a 4×4 does not make you invincible. Of this, I was already well aware. Even so, I was surprised to get wheelspin as I pulled away in the Discovery (diff lock not engaged as snow coverage was patchy) and even more surprised that the first sharp turn had it feeling very twitchy. Proof that despite the rather general ‘Mud and Snow’ tag on the Avon Rangers, the compound just was not soft enough to provide good grip. I engaged the diff-lock for steep descents, and it was nice to have that luxury. By engaging the diff lock, I was more effectively spreading the braking between the two axles, hopefully making it less likely that I would lock a wheel should I have to brake. The best way to avoid wheel lock is of course to use a low gear and keep well away from the middle pedal, but you never know what’s around the next bend. But, even when the snow had cleared enough to leave dry tracks on the road surface, hitting the banks of slushy snow in between left the Discovery feeling very unstable. I got back home and jumped into the Sirion. Straight away, the Sirion felt very different. Sure, the lack of four-wheel drive meant wheelspin was impossible to avoid when starting on a snowy slope (or from where it is pictured above on fresh snow) but it felt more stable. Hitting slush was no more dramatic than dry tarmac. 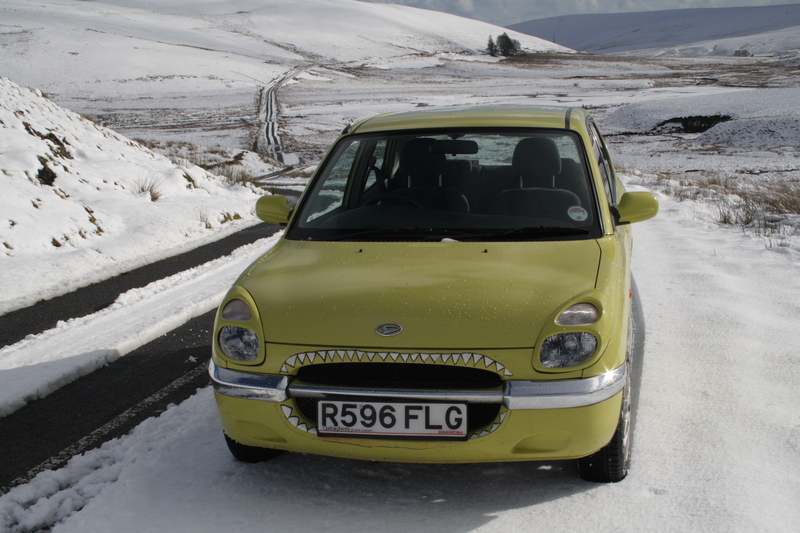 The Sirion also proved how great proper winter tyres are at stopping on snow and ice. For the above shot, I braked gently on the fresh snow with no ill effects, then pressed the pedal really hard, which finally made the anti-lock brakes kick in. For me, this stopping power is what makes winter tyres an essential item. It isn’t a conclusive test, as I was unable to test both cars on exactly the same roads, at exactly the same time. I also didn’t have the luxury of trying the Discovery on winter tyres or the Sirion on summer ones for direct comparisons. One thing I will say is that the high degree of power assistance to the steering on both vehicles is very detrimental in these conditions. It’s very hard to know exactly how much grip the front wheels have, as so little feedback comes through the steering wheel. This means it’s easy to be in a skid without realising it. A reminder that perhaps I should have dragged the 2CV out of its cosy garage! I’ve found the BFG AT in a narrower size such as 235 is a superb snow and ice tyre on a Land Rover or jap pickup, as good on ice in 2WD as most 4×4’s in 4WD on inferior tyres. Funnily enough, I took off the 235s when I bought my Disco, and fitted correct-for-period 205s instead. I think two of the tyres may be slightly old, which might be contributing to the poorer performance. Yes, usually the narrower the better for winter but the BFG AT is very narrow tread contact area for its nominal width so is same as many 205 wide. The BFG AT has sipes though which many AT’s don’t and it is the sipes that give the grip. They aren’t a true winter tyre but in my experience they are one of the best AT tyres for winter use.